I'm coming to you on during the weekend to share a layout that I just finished. I wanted to create a very photo centric layout with some shots from our trip to Rome. I know I've talked your ears off, and probably tired your eyes out, with my posting about Rome and the photo book. Well, it doesn't end there, folks! :) In any case, Liv.e Desings' new T+Mini Kit helped me with that. 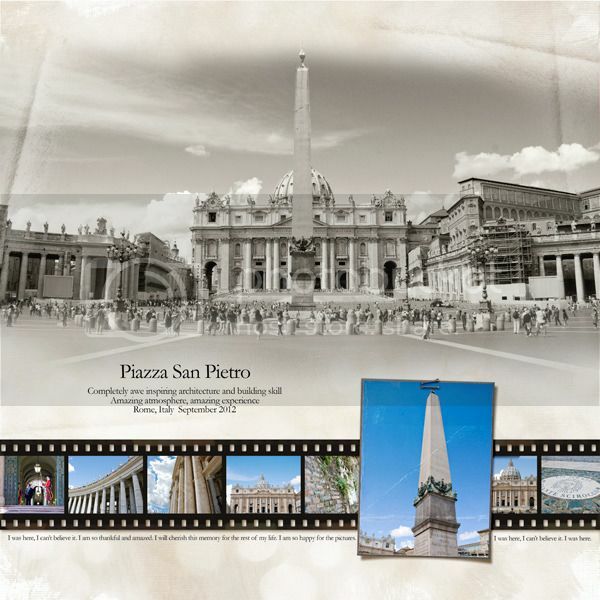 I like that I was able to combine the large photo of the stunning San Pietro with a whole bunch of photos that show details of the piazza and building. I like how the large photo draws your eyes in to look at the smaller ones.